You know that intoxicating feeling you get when you buy someone a gift, and upon giving it to them, you see an enormous smile sweep across their face? It’s the best thing on earth. So, if you’re anything like me, you derive great pleasure from giving gifts – from sharing something of yourself with others. As a kid I always loved getting gifts, and truly nothing has changed since then. I never understood why my parents would always take photos of me opening presents – was it because they loved documenting me with awful “sleepy hair” on the morning of my birthday? That’s what I used to think. Now as an adult, I realize they loved capturing my enormous smiles – my unadulterated joy and sheer happiness. Those reactions were just precious. I get it. My parents were the best. They still are. This week, I received one of the coolest gifts in a while. I was invited by Amorino Gelato to come and take a behind-the-scenes tour of their flagship NY shop, learn about how they make each flavor, and even sample some gelato straight out of the machine. I was in seventh heaven. Sorbets and Gelatos. All Natural. All Delicious. Amorino’s name pretty much sums up their company’s motto and ethos. The translation of Amorino is “little love” or “cupid”, and they try to infuse every single bite with a little bit of love. Love for authentic Italian gelato, love for high-quality, organic ingredients, and most importantly, love for excellent flavor. Amorino believes (and I agree!) that their goal is to get the best flavor possible, using the best possible ingredients from around the world. They attempt – and in my opinion succeed – in infusing every single bite with strong flavor notes that are representative of true artisanal Italian gelato. 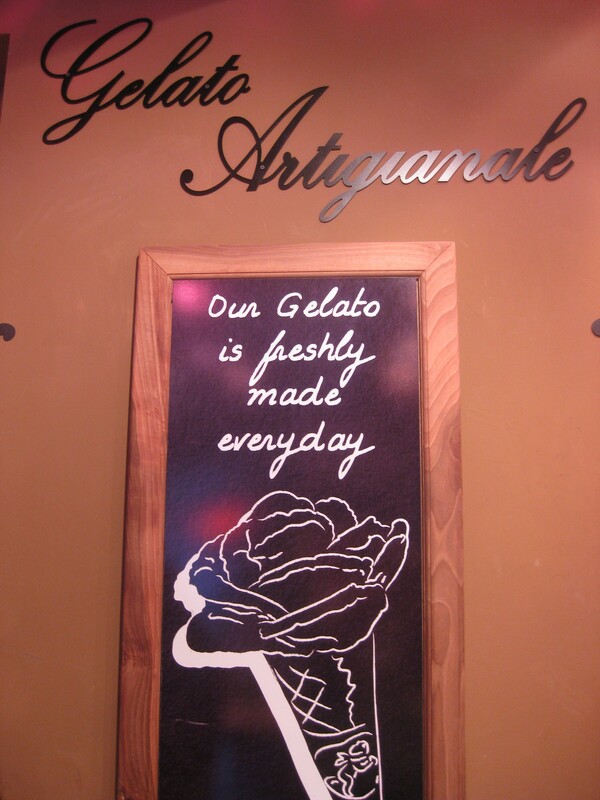 Churning the gelato...made fresh daily! Filippo, the EVP/COO of the US branch of Amorino (did you know that they have 53 stores in Europe?) is from a small town in Italy, called Reggio Emilia. 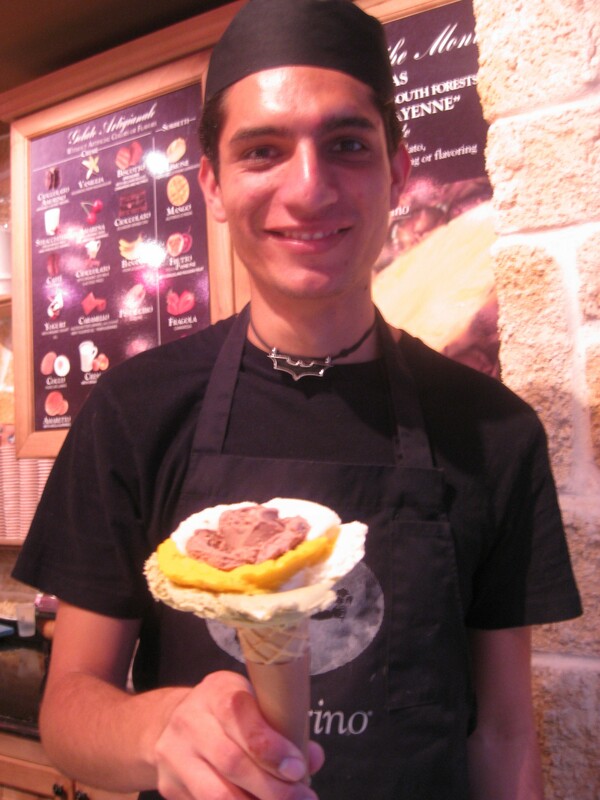 In his town of 150,000 people (or 400,000 if you count the surrounding areas) there are 80 gelato shops. That’s insane (and my dream come true!). His father is a Gelato master, and it’s this family treasure that has propelled him, and Amorino, forward into the US gelato market. For consistency’s sake, Amorino mixes all their ingredients in Paris (where the company is headquartered) and blast freeze it before sending to NYC for production. 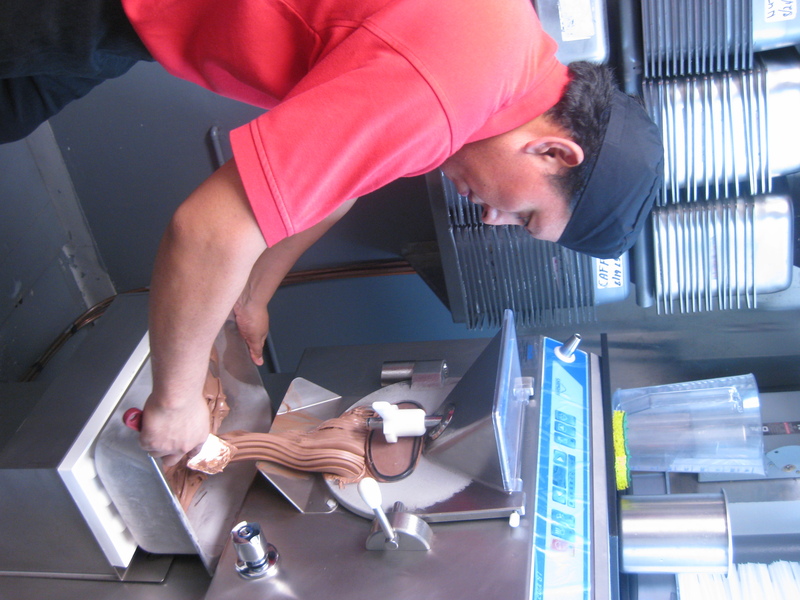 Then, in the basement of the Union Square shop, they churn each individual flavor daily. Everything is all-natural so even though they use stabilizers, theirs are totally natural. In fact, they are so committed to good, wholesome ingredients that if you take a close look, their grapefruit sorbet is uber shiny – “too shiny for my taste” says Filippo. But, the shine is actually a result of the organic stabilizer – and let me tell you, it is delicious. I suppose the shininess is just a small price to pay for organic, natural delights. And that's my chocolate gelato straight from the machine. Life is good. Good ingredients make good gelato. Plain and simple. So it should come as no surprise that Amornio uses only the best of the best. Pistacios from Sicily, Hazelnuts from Piedmont, Chocolate and Bananas from Ecuador, Vignola Cherries from Italy, Alphonso mangoes from India, Speculoos from Belgium, and Amaretto and Passion fruit from Italy. But, the best flavor, in my opinion is “L’Inimitabile” literally meaning, “it can’t compare.” Well hell, they’re sure right about that! This flavor (once called Nutella) is a chocolate hazelnut that is, simply put, to die for. The flavor is so accurate, yet not too rich, so creamy, yet not too milky, and utterly delicious. 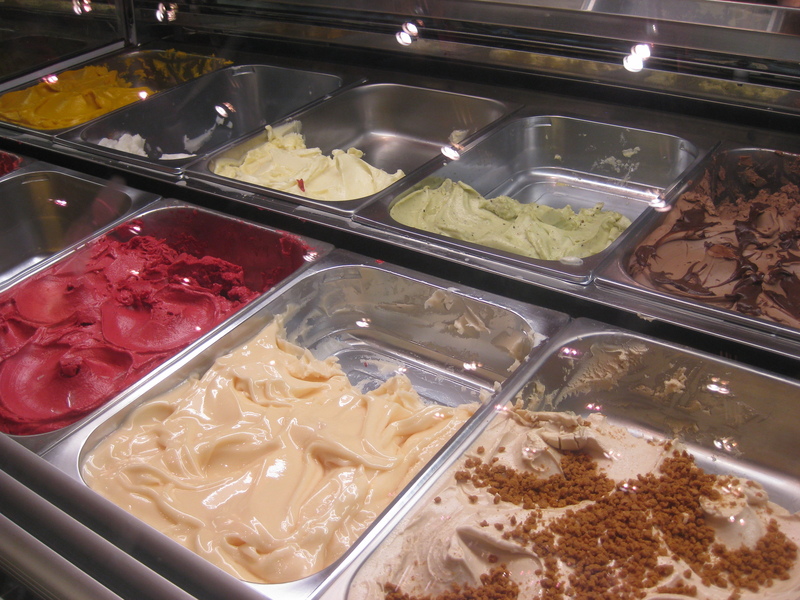 Artesanal Gelato. Fresh Daily. The sign says it all! Visiting their kitchen was a dream come true – and being able to sample chocolate gelato straight from the machine as it was churning, is something I will never forget. It was outrageous! Delicious! I loved it. Ti amo! Italian is, after all, the language of love. At the end of my tour, I got my very own Amorino flower. When I asked Filippo how this shape came to be, he told me that’s how gelato is served in his region. What? You mean, not only did those geniuses create gelato but they also invented the beautiful presentation? They don’t glob half scoops of gelato into a cone and hand it to you, half melting down the side. Instead, they meticulously (yet impressively quickly!) craft a flower, with the most firm flavor in the middle to create the center petals, and up to 22 other flavors surrounding it. 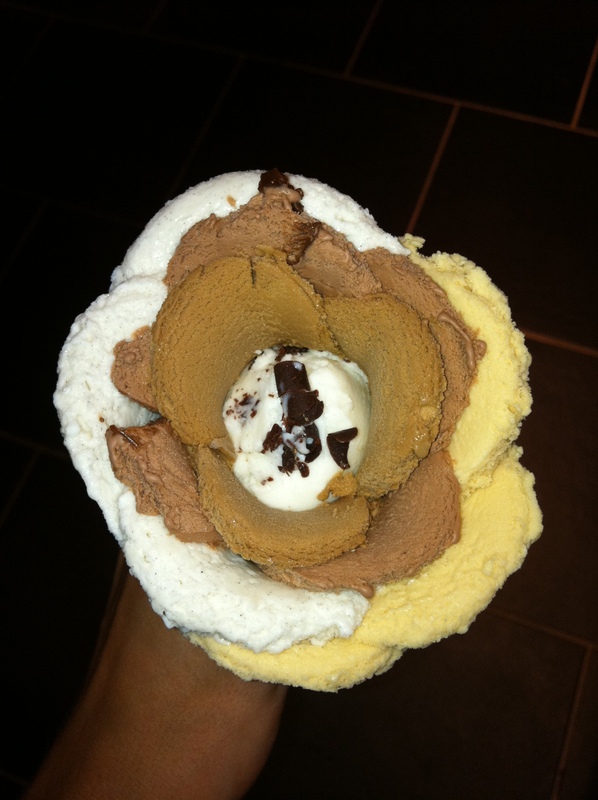 For someone who loves to sample a lot of flavors (but not too many at once, or else you’ll miss the unique flavor that each one offers), this Amorino flower is the way to go. 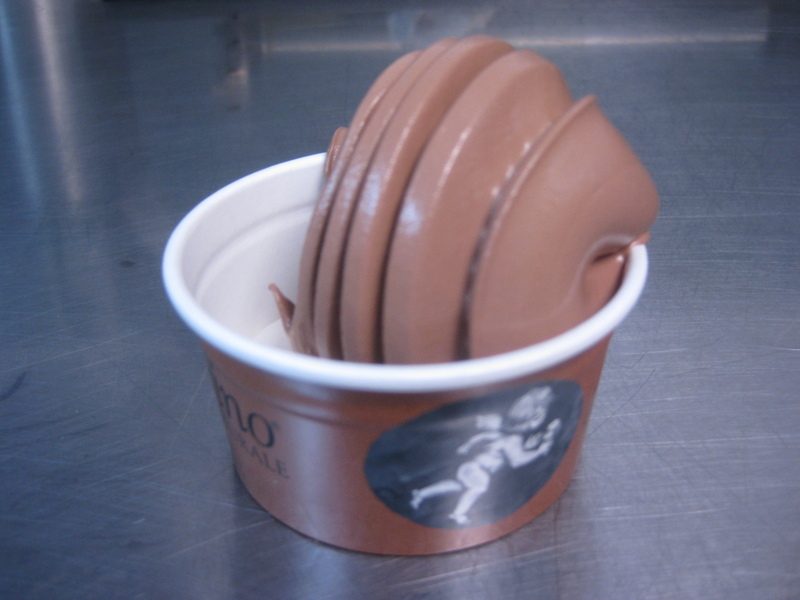 Bottom line: run, don’t walk to Amorino. You must taste what I’m talking about. Luckily, as I was leaving, Filippo sensed my sheer happiness, and managed to snap a shot of me eating my very own Amorino flower (that’s my flower on the right, but not me!) Filippo definitely gets it. Sharing your gift with others is, in it of itself, the greatest gift one can give. Thanks Amorino for sharing your story and gelato with me. It was truly a precious present!